Not advice specific to Symbaroum and not to be used without care and consideration, but I have found in running the game, with a mind to expanding the horizons of the setting, saying “Yes” helps. You will find similar advice scattered across websites, books, magazines, and podcasts. The principle embraces the need to find progress no matter what because challenge without progress tends to be frustrating and isn’t enjoyable. When you sit down at a table for a 3-hour convention slot, the last thing you need will be a GM armed with a string of “No” responses. During the adventure that I ran at Concrete Cow and Go Play Leeds, I found that the battle scene at the end worked so much better when I listened to what the players had to say and agreed with them. When the players come up with the fiction, you don’t let them steer the game – you let them contribute their vision. You can’t see what they have inside their heads any more than they can see what’s in your’s – but if they offer an insight, run with it. That internal vision has their character at the centre of it and their companions dotted around. If a player says something and another player agrees, with a nod or a chuckle, they’ve made a connection – they have an overlap in their internal vision of the scene you set. Don’t ruin the moment. If what they suggest doesn’t totally run contrary to events or introduce some inexplicable deus ex machina, go with it. Embrace it. You plan the essentials. You lay the markers, measure out the masking tape, set the boundaries. If you work your adventure out to the Nth degree, you create something closer to the theatre with actors playing to a script. Down that way railroading lies, the linear shuffle of characters along a narrow and all-too-well-defined path. Players exist to derail your adventure ideas, so the looser you plot the easier you will find the experience. In one scene I describe a monstrous undead titan striding across the battlefield, thunderous footsteps sending shockwaves through the ground. The characters could see units of soldiers coming their way, so asked whether they could identify the uniforms and, from that, the commanding officer. A player commented that the commander would probably be riding the titan and make it a pain to deal with him. The characters see just that. They focus on the titan and see that behind the scarred and lifeless head an odd wisp of darkness wafts like a shroud. I figure an army of the undead warrants a wraith-like commanding officer, so I use the stats for a Necromage and take it from there. The players share a vision and create a problem for themselves at the same time – and all I had to do was agree with them. Yes, you recognise the uniforms, but you can’t see any sign of a clear commander as you scan the units spread out across the field. Until you cast your eyes across the titan and see a strange shadow lingering like a funereal cape. Some kind of wraith rides the giant, leaning forward to whisper commands into it’s ear. What do you do? Ideas are good. Encourage them. As I say, don’t let the players take advantage – just listen and reincorporate what they say into the game in a way that works within the bounds you sketched. When you share the experience and take on what they say with a deft “Yes, and…” or “Yes, but…” you draw them into a shared world. 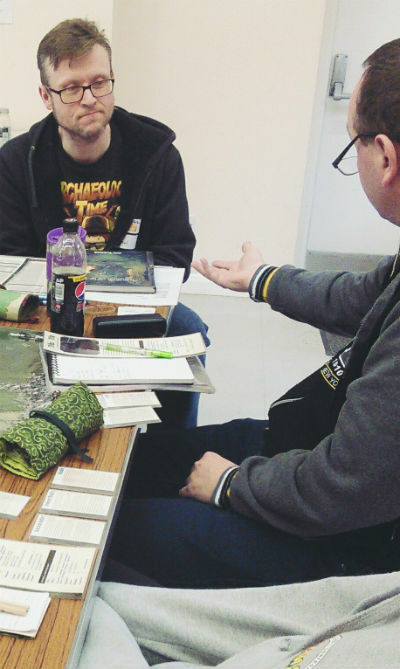 I find that my Symbaroum sessions work better when I take advantage of the sense of setting. When I give my spiel at the beginning about the struggle, the hardship, the corruption and the threat of Davokar, I do that to set the tone and then follow the players’ lead in how far we go. I have found it far easier to give a sense of grimdark when players drive some of the bounds. Violence, abuse, depravity – you should set the basic thresholds and the “Don’ts” at the start of the session, then take the tempo and tone from how the players react to developments. Build on the engagement. Listen and respond. Pool the creativity and enthusiasm of the group, then see where that takes you.